Home » Cryptocurrencies » Alternative cryptocurrencies: a great investment opportunity or a new bubble? Alternative cryptocurrencies: a great investment opportunity or a new bubble? The world of digital currencies is not only about bitcoin. In terms of capitalisation, the market share of this oldest cryptocurrency fell below 50% at the end of 2017 and the down trends goes on. In December 2016, bitcoin’s share of the total cryptocurrency market was 90%, while in the meantime many other cryptocurrencies came into existence closing the gap significantly. Bitcoin Cash is a remarkable phenomenon as well. It emerged after splitting from Bitcoin (known as a hard fork) in August 2017 as a result of long-term disputes within the bitcoin community. Nowadays, its value is USD 41 billion, primarily owing to the entry to Coinbase. However, some voices point out to unfair manipulative practices with the value of the new crypto. Similarly to bitcoin, most of altcoins get into the digital deposits through mining. Miners provide the blockchain system with computing capacity in order to carry out crypto transactions (transfer of cryptocurrency from one wallet to another). They get a reward in form of new units of the digital currencies. To avoid devaluation, the final number of units is limited from the start (ethereum is an exception). The reward for the computing capacity declines exponentially and the mining process is more and more affected by the growing demands for hardware. With the declining efficiency of the mining process the position of cryptocurrencies is still good enough to motivate miners to execute crypto transactions. The growing rewards for the processing of blockchain operations play also a role (e.g. each bitcoin transaction is charged a few cents or dollars). The second half of 2017 was the first golden age of digital currencies. The total value of all cryptocurrencies reached hundreds of billions US dollars. The same as real estate or gold, bitcoin has become a strong investment instrument. In parallel, dozens of new cryptocurrencies are emerging. 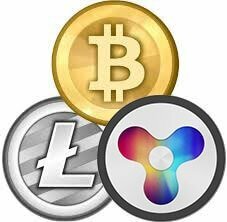 Right now, there are more than a thousand cryptocurrencies, of which only a handful is worth attention. Visionary ambitions are associated for instance with the OTN token. The „Open Trade Network“ concept aimed at interconnecting individual blockchain networks with yet non-existing cross-chain technology to make the exchange of cryptocurrencies simpler without having to rely on third parties. The arrival of new altcoins is also accompanied by a new phenomenon – initial coin offerings. ICO means a prioritised offering of cryptocoins to some selected investors to enable further capitalisation. In the past, the phenomenon of ICO was the driving power for the rise of Ethereum’s price. The principle of ICO is similar to the one used for the initial start-up investments during the first boom of online companies, giving birth to giants such as Google, eBay or Amazon now having colossal impact on their industries. The same ambitions are expected from the digital currencies. The easiest way to get new cryptos is mining. (The description of this process is beyond the scope of this article). A second option is to buy the cryptos at exchanges. Don’t be shy! Go to reliable exchanges with a proven track of altcoin trading that are trusted by a large community and experts such as Coinbase or CoinMate. Think twice before you start. Fraud may occur in the currencies in circulation. Fraudulent issues of altcoins (known as „scamcoins“) haves stolen money from many investors. As an example of such as a Ponzi scheme I can name OneCoin. The promoter of the project – Onecoin Ltd. – put its own interests over those of the investors selling the crypto once the value reached a profitable level. You can be a traditional user exchanging USD for cryptocurrency at a certain rate, just like when exchanging for other currencies for your holiday abroad. Leave your altcoins in your wallet or at an exchange. Later on, once the value of your cryptocoins has increased, take the crypto and convert it back into your previous currency. Ideally, you will get a multiple of your initial investment. If you had retained all your money in bitcoins from 1 January 2017 to 31 December 2017, you would have earned around 1300 %, i.e. 13 times as much as you had at the beginning of the year. 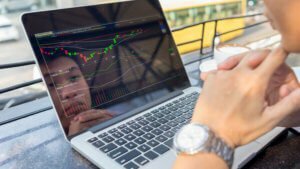 On the other hand, you can use cryptocurrencies for speculating and earn money in the short run in the same way as on Forex. You can do this for example with Plus500, or IQ Option. With the traditional way of holding cryptocurrencies, you cannot use leverage for trading. It might be better not to use it, because it might seem difficult to comprehend in the beginning. However, there is nothing that complicated about leverage trading as it may appear at first sight. Leverage trading offers you to multiply your initial investment. If you have on your trading account, let’s say 10 000 USD and use a leverage of 1:10 you can open trades as if you had on the account 100 000 USD. Your earnings will potentially be ten times bigger. The bad news worth mentioning is that the same principle also applies to the opposite direction, when you lose. FREE DEMO ACCOUNT $ 10 Up to 1:300 Review Trade Now! Great broker for german clients $100 Up to 1:30 Review Trade Now!